Thank you letter from Martha Berry to the Treasurer General of NSDAR thanking seven different DAR chapters for their generous donations and interest in the Berry Schools. 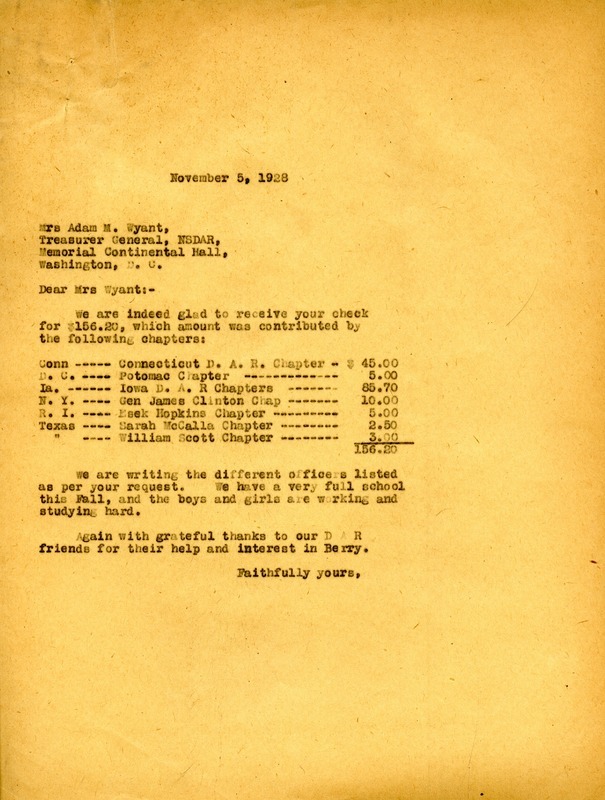 Miss Martha Berry, “Letter to Mrs. Adam M. Wyant from Martha Berry.” Martha Berry Digital Archive. Eds. Schlitz, Stephanie A., Meg Ratliff, Rachel Renaud, Jordan Nale, et al. Mount Berry: Berry College, 2012. accessed April 22, 2019, https://mbda.berry.edu/items/show/7215.